China on Sunday inaugurated a research center in Cairo, Egypt, affiliated with Beijing’s ambitious multi-trillion dollar Belt and Road Initiative (BRI) that the United States believes is being used as a predatory lending practices vehicle to bury nations across the continent in debt and undermine their sovereignty. China’s Renmin University and Egypt’s Ain Shams University on Sunday inaugurated the Belt and Road Cooperation Research Center in the Egyptian capital Cairo. During the opening ceremony, President of Ain Shams University Abdel Wahab Ezzat said that establishing the center came after one-year negotiations, which resulted in a Memorandum of Understanding that his university signed with Liu Wei, president of the Renmin University. Ezzat praised the establishment of the Chinese research center. Ezzat indicated that the “center aims at conducting economic, commercial and technical studies for projects and cooperation between Egypt and China,” Xinhua notes. Liu also welcomed the center’s inauguration. 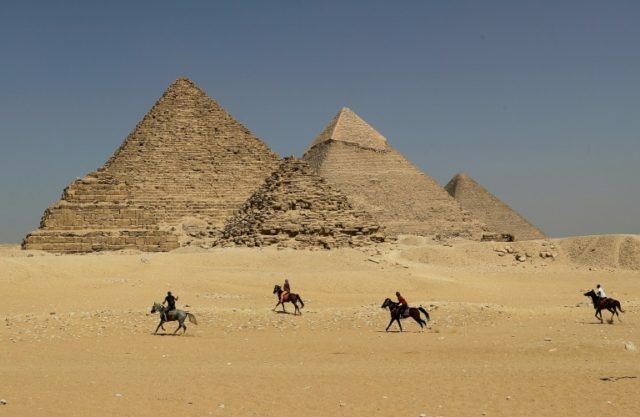 “Egypt and China are countries with ancient civilizations…We were connected in the past by the maritime Silk Road which reached Alexandria,” he told Xinhua, referring to the port city in northern Egypt. “I hope this center will be a bridge linking Egypt and China for increasing cultural and economic ties,” Liu also said. The BRI, also known as the One Belt, One Road (OBOR) project, aims to revive the ancient Silk Road, linking Beijing to Europe and possibly the Western Hemisphere, through a massive network of land and sea routes. The U.S. military has described BRI, namely plans to expand it into Latin America, as a threat that may create security vulnerabilities for the United States by allowing Beijing to expand its influence across the world. Amb. Song Aiguo, the Chinese envoy to Egypt, reportedly claimed that the various countries in Africa welcomed the construction of the research center. “I wish that we will benefit a lot from the ideas of this center,” he declared. The U.S. has repeatedly accused China of engaging in “predatory” lending practices across Africa. A report from Kenya’s Daily Nation confirmed America’s concerns that China is using debt to erode the borrower countries’ sovereignty. China has emerged as America’s top competitor in Africa at a time when U.S. President Donald Trump’s administration is withdrawing some American troops from the continent. Echoing other American officials when unveiling Trump’s Africa strategy last month, U.S. National Security Advisor John Bolton acknowledged that China’s “predatory practices” in Africa interfere with American military operations on the continent. “The predatory practices pursued by China and Russia stunt economic growth in Africa; threaten the financial independence of African nations; inhibit opportunities for U.S. investment; interfere with U.S. military operations; and pose a significant threat to U.S. national security interests,” Bolton proclaimed. Beijing’s “predatory actions are sub-components of broader Chinese strategic initiatives, including ‘One Belt, One Road’ — a plan to develop a series of trade routes leading to and from China with the ultimate goal of advancing China’s global dominance,” Bolton further explained. Beijing is actively seeking to “obtain more political, economic, and military power” across Africa, he stressed. Bolton asserted that Trump’s new Africa strategy will counter Russia and China.